The Eleventh Doctor third season is fast approaching, based on the TV show character portrayed by Matt Smith. The Eleventh Doctor first appeared in The End of Time (2010). Series writer Rob Williams (Ordinary, Revolutionary War, The Royals: Masters of War, Trifecta) is commencing a new adventure through time and space with artists Simon Fraser (Nikolai Dante, Grindhouse) and Leandro Casco (Doctor Who). The Doctor and Alice Obiefune, seeking a fresh start after the stresses of last year’s epic mystery, set off in search of strange new worlds and amazing new sights. The new season will be structured in single issue, stand alone stories. Titan are presently engaging in series runs of the Tenth and Twelfth Doctor titles. 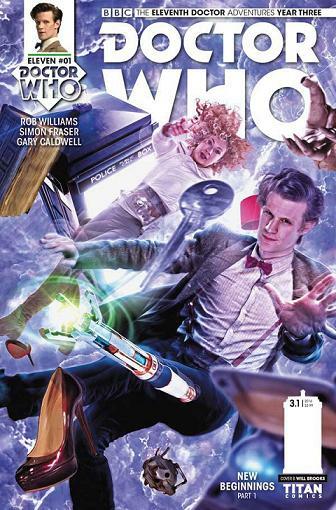 Issue 2 of the Eleventh Doctor Year 3 will be published in February.